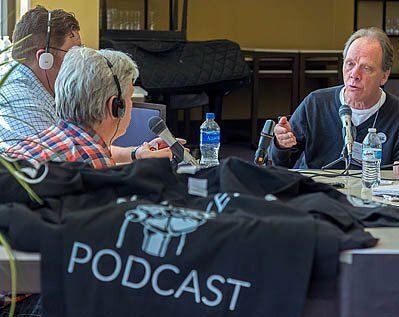 Chicago, Illinois - Members of the International Longshore and Warehouse Union (left) produce The Docker podcast during the biannual Labor Notes conference. They are interviewing Peter Knowlton, president of the United Electrical Workers. Image Description: Chicago, Illinois - Members of the International Longshore and Warehouse Union (left) produce The Docker podcast during the biannual Labor Notes conference. They are interviewing Peter Knowlton, president of the United Electrical Workers.